We have spent the last few weeks focusing on the design of the default communication features of the Librem 5. As part of that process, we came up with the design specification for two applications. One of them is called “Calls” and has been designed for the purpose of—you guessed it—making and receiving phone calls. The second one, called “Messages” has been designed for the no less obvious purpose of sending and receiving messages. Tobias, our lead designer, does a great job in communicating and collaborating with the GNOME design team, and so we keep making progress jointly with the upstream GNOME project. 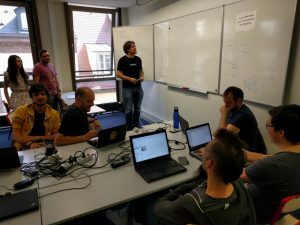 When Tobias joined, we started by having a call with Allan Day and Jakub Steiner (from the GNOME design team) where we presented our project, our goals and discussed the way to structure our contributions to GNOME. For example, we have an app design repository on the upstream GNOME GitLab server, where our design and mock-ups are made available to everyone. All in all, our project and vision seem to be very well received by the GNOME community. This application is not based on any existing application so we had to design it from scratch. We did so while Bob was making good progress on implementing the basic cellular call features. “Calls” is supposed to let the user handle regular phone calls but is not limited to that. It is designed to integrate a much higher level of security and privacy through end to end encrypted technologies in a very transparent way. Private calls, between two devices supporting that feature, would be made by simply selecting a contact and pressing the “call” button. 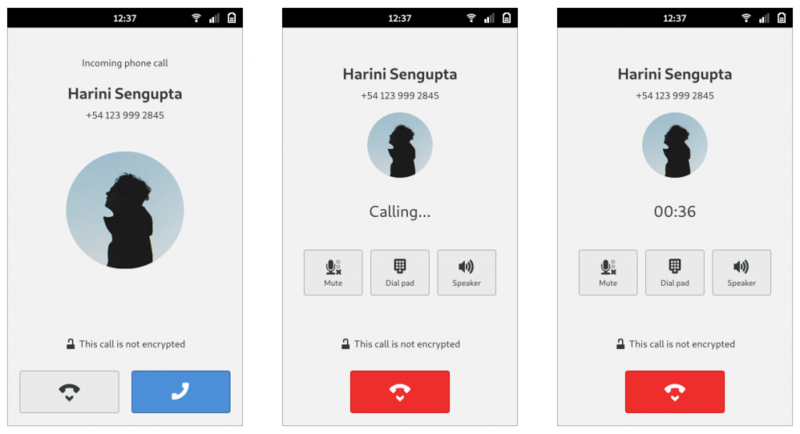 The full design of the Calls application can be seen in its own repository. 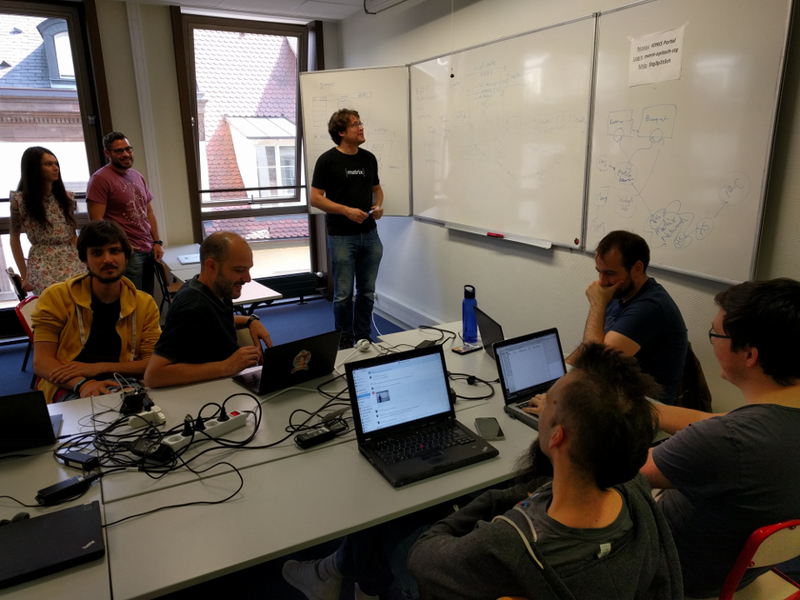 At the beginning of the summer, some Purism members (Dorota, Adrien, Tobias and myself) participated in the Fractal hackfest in Strasbourg. The goal was to analyze and discuss the possibility of having Fractal become the default messaging application on PureOS and the Librem 5. This is motivated by our wish to be in sync with upstream choices as well as with the fact that Tobias, besides being the designer for the Librem 5 applications, is also the designer of Fractal. We also took this opportunity to meet Matthew from Matrix who provided very helpful technical clarifications about the Matrix technology. It was clear in this meeting that Fractal’s future plans are aligned with the Ethical Design principles, that the Librem 5 and PureOS design guidelines are based on. An application following those guidelines, must be simple and focused on a single purpose. One might think that the current state of Fractal already fits the main purpose of the Messages application (sending and receiving messages), but it is actually too general in terms of purpose. Chatting privately with a friend is not the same as discussing in a crowded IRC like public room. While the back-end technology may be the same for both situations, the user interface may have different requirements. This was discussed at the Fractal hackfest (Tobias used the analogy of the “barbecue” and the “banquet” to expose the problem), where Fractal developers decided that Fractal should be split into two distinct applications; one application would be used for the purpose of private 1 to 1 and small group chats (the barbecue), the other one would be used for the purpose of crowded IRC like discussions (the banquet). It will take a while for that split of an existing application to happen, however. 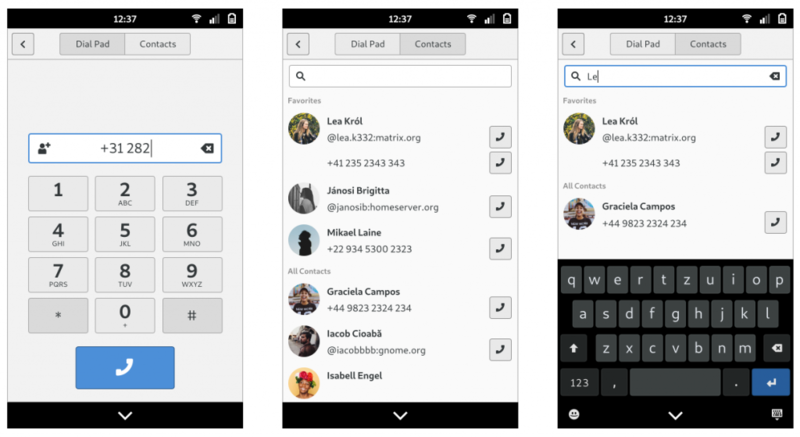 The simplified Messages application we have been developing is based on the “barbecue” usecase; private 1 to 1 and small groups chats, the most common usage for the majority of the population. The plan is for the Messages application to be able to handle regular text messages (SMS) while also handling secure end-to-end encrypted messages in a transparent way between two compatible devices. 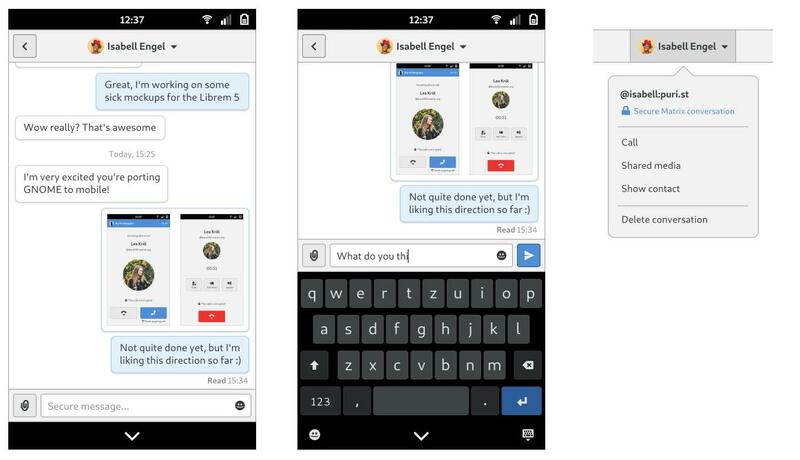 The full design of the Messages application can be seen in its own repository.